The Asian Human Rights Commission (AHRC) continues to receive reports of violence being wrought by soldiers and police against civilians in remote West Papuan villages. In the latest case a joint operation responded to an illegal flag raising by the banned Free Papua Movement with indiscriminate violence against civilians. Soldiers have reportedly burned 30 houses, killed livestock and shot threateningly around local residents, many of whom took refuge in the forest for a few weeks out of fear. In another case a man was shot in the stomach and died before reaching the hospital. Complaints to the local and central offices of the national human rights commission have not been taken up. In July members of the Free Papua Movement (OPM) reportedly raised the West Papuan flag and the United Nations (UN) flag in the yard of a house in Jugum village, which is in the Bolakme district of the Jaya Wijaya Regency. The Papuan flag is known as the Morning Star (pictured here) and is banned in Indonesia due to its association with pro-Independence resistance groups (see more on this below). On 3 August local OPM members were approached by representatives of the government, religious leaders and the Jaya Wijaya district police to discuss lowering the flag, and a meeting was held with members of local human rights NGOs and the local tribal council. However no compromise was reached. On 5 September at around 5am, armed soldiers and police officers arrived in the village from Wamena to conduct a ‘sweeping operation’ (a targeted operation to intimidate, usually involving the destruction of property) against the OPM, but they found neither the members nor the flags. However according to witnesses they proceeded to set 30 houses alight (pictured above, right and here), seemingly at random, and shot four pigs. They then threatened villagers with bursts of gunfire, scaring many of them into the surrounding forest. Some of the residents remained in the forest for two weeks out of fear, and many fell sick due to the lack of food and medical treatment. The bullets were later collected by the residents (pictured below) as evidence. The AHRC has recorded various violations that have occurred during these kinds of sweeps, and continues to hear of others. On 11 July 2009 in Mantembu and Yapen villages (Yapen regency) civilian houses were also reportedly burned, and one local resident was shot in the stomach. Yawan Wayeni (39) was suspected of being involved in a ceremony in which the Morning Star was raised, and he died before reaching the hospital. Several local human right organisations have protested and submitted complaints to the National Commission for Human Rights (Komnas HAM) and the Papuan Branch of the Commission for Human Rights. However no thorough investigations have been conducted into any of these incidents. 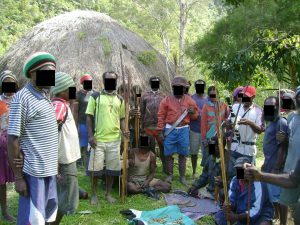 Tens of thousands Papuans are reported to have died in military operations since the province was annexed by Indonesia the sixties (some sources claim up to 200,000 have been killed  around 10% of the Papuan population), and there is a widespread fear of soldiers among indigenous villagers. Papuan villages are remote and their residents enjoy little access to institutions of justice. However violations are also taking place in towns and cities. On 16 March 2006 a sweeping operation was carried out against university students in Abepura by police and the military and students from several Pegunungan Tengah regencies were evicted from their dormitory because they were suspected of being involved in an attack against a local police office. Operations were conducted in 2003 and 2005 in several districts (Tinginambut, Yamo, Mapenduma, Kywagi, Bolakme and Serui) resulting in the burning of homes and churches and the destruction of crops. These kinds of actions lead to chronic food shortages and other hardships and have resulted in increased calls for autonomy – and independence – in this resource-rich province. Inequality remains a pressing issue. The autonomy law has been in effect since 2001 but has not resulted in an improvement of living conditions or political freedoms for Papuans. Efforts by the administration in Jakarta to better the situation tend to flounder due to the strong grip the military holds on the area’s resources, and because of corruption on the local government level. It is evident from the cases above that the Indonesian government is not following through with its guarantees to protect human rights in West Papua. As a member of the UN, Indonesia is committed to respecting the international human right instruments, including the Universal Declaration of Human Rights (UDHR: particularly article 3, article 8, article 9) and the International Convention on Civil and Political Rights (ICCPR), to which it is a state party. 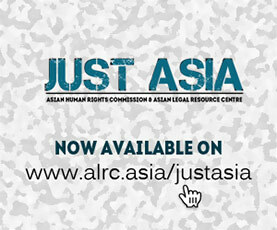 Article 2.3 entitles everyone to effective remedy, while the AHRC would like to highlight article 6, the right to life; article 7, freedom from torture; article 15, presumption of innocence; article 16, equality before the law; and article 18, freedom of expression, freedom of religion and freedom of choice. On a national level, the right to protection is protected by the constitution, especially in article 28 B p.2 and article 28 G p.1, and in domestic legislation such as article 29 p.1 and article 30 of law no. 39 of 1999. Furthermore, earlier this year the Chief of the Indonesian National Police enacted the new Regulation of the Chief of Indonesian National Police Number 8 of 2009 which deals with the implementation of human rights principles and standards in the discharge of the duties of the Indonesian National Police. Indonesia also has Law number 34 of 2004 for the Indonesian National Army (TNI), particularly article 2 p.d (on TNI professionalism and respecting of democracy, civil supremacy and human rights) and article 5 (on the roles, functions and duties of the army). Furthermore it should be noted that for a short time in 1961 and 62 the Morning Star was the national flag of West Papua, and has emotional significance for many Papuans. Under international law the expression of political opinions  in the display of a flag or any other non violent form  should not be considered a crime. The AHRC condemn the imprisonment of political activists and their continued persecution, as reported in previous appeals: UAU-004-2009, FUA-008-2009 and UAU-071-2008. Please send letters to the authorities listed below to call for an immediate investigation regarding TNI and police violence during raids, urging disciplinary and legal action against those found to be involved. 1. Papuan residents of Jugum village. I am writing to voice my deepest concern regarding the abuse of power by the armed forces and police against local residents in Jugum village. According to the information I have received, members of the Free Papua Movement (OPM) reportedly raised the West Papuan flag and the United Nations (UN) flag in the yard of a house in Jugum village during the month of July. On 5 September at around 5am armed soldiers and police officers arrived in the village from Wamena to conduct a sweeping operation against the OPM, but they found neither organisation members or the flags. However I am appalled to hear that they proceeded to set 30 houses alight, seemingly at random, and shot four pigs. They then threatened villagers with bursts of gunfire, scaring many of them into the surrounding forest. I am told that some of the residents remained in the forest for two weeks out of fear, and many fell ill due to the lack of food and medical treatment. Reports continue of violations occurring during these kinds of sweeps, despite the enaction of the new Regulation of the Chief of Indonesian National Police Number 8 of 2009 and various laws regarding the conduct of the TNI, such as Law number 34 of 2004 articles 2 and 5. On 11 July 2009 in Mantembu and Yapen villages (Yapen regency) civilian houses were also reportedly burned, and one local resident was shot in the stomach. Yawan Wayeni (39) was suspected of being involved in a ceremony in which the Morning Star was raised, and he died before reaching the hospital. I understand that several local human right organisations have protested and submitted complaints to the National Commission for Human Rights and the Papuan Branch of Commission for Human Rights regarding the cases, and I am concerned to hear that no thorough investigations have yet been conducted. I urge you to ensure that such investigations are carried out through all available legal channels to ensure justice for the victims of these abuses, and to prevent them from occurring again.